With 458,490 international students enrolled in UK universities in 2017/18, the UK’s higher education sector experienced 4% growth over the previous year. Newly released Higher Education Statistics Agency (HESA) data shows that, of overall enrolments, 247,685 were new commencements, and this too represents an increase over 2016/17 (5%). The growth pattern behind these top-level numbers reverses the one we saw in 2016/17 where first-time non-EU student numbers had fallen off and first-year EU numbers had increased by 6%. In 2017/18, first-time EU enrolments (i.e., new commencements) dropped slightly (by roughly -1% to 62,270) while first-time non-EU enrolments grew by 7.5% to 185,415. 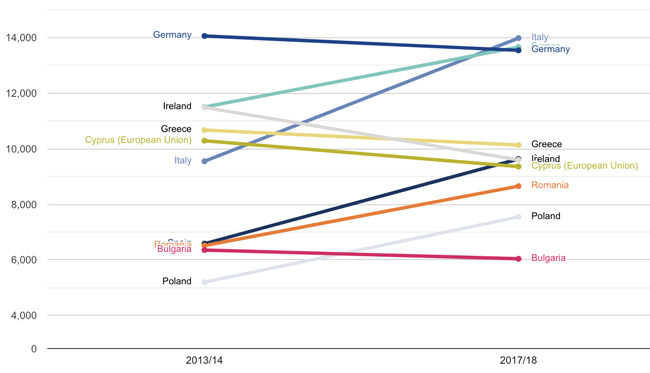 As the following chart reflects, Italy, France, Spain, Romania, and Poland have shown the strongest growth among the top EU sending markets for British universities. Gains from those countries have helped to offset five-year declines from other top senders as of 2013/14, including Germany, Ireland, and Greece. There are now 139,150 EU students enrolled in UK universities along with 319,340 non-EU students. Within those totals, Chinese students number more than 100,000, meaning that one in five international students in the UK are Chinese (with this key sending market accounting for one in three among non-EU students). If anything, this heavy reliance on the Chinese market has increased over the last five years. Among the UK’s top ten non-EU sending markets, only China, the US, and Hong Kong have registered notable growth since 2013/14. In real terms, China, with a net increase of 18,630 students over this period, accounted for nearly all of the net growth in non-EU enrolments from 2013/14 on. 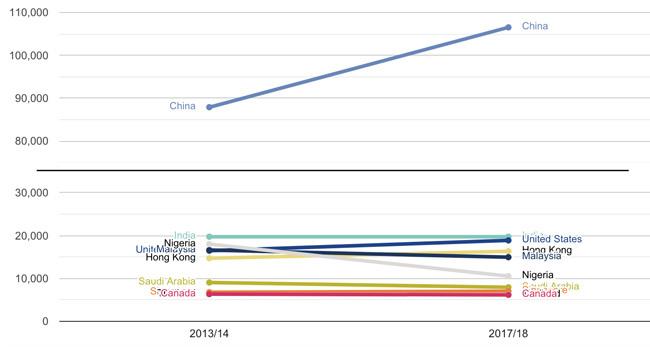 Overall, the number of Chinese students enrolled in British higher education increased by 21% between 2013/14 and 2017/18, and this has helped to offset declines from most top ten sending markets over those five years. Nigerian numbers have especially fallen off over this period with a nearly 42% decrease since 2013/14. For years, there have been troubling decreases in the number of Indian students coming study in UK universities following the tightening of post-study work rights for international students introduced in 2012. But in 2017/18, Indian enrolments increased to 19,750 compared to 16,550 the previous year, representing growth of 19.5% and effectively restoring Indian enrolments to 2013/14 levels. The new number is still far off the more than 39,000 Indian students enrolled in 2010/11, but the recent growth is significant and welcome. This entry was posted in Europe, Higher Education, Most Popular, Regions, United Kingdom and tagged UK universities, British higher education, British higher education institutions, . Did growth in outbound Chinese mobility really slow in 2013?